Once the file is downloaded, it should only take a couple of minutes to get the music into iTunes. Again, once the file is downloaded, Right click on it, and Unzip/Extract the file. It will Unzip/Extract into its own folder. Open iTunes, create a Playlist, name the Play list the name of the Mix. Making sure you can see iTunes and the Folder with your music, drag the Folder (Not the individual songs from inside the folder) onto your new playlist. The playlist will now populate with all the music with in the folder, In proper order. This is usually caused by your song list being out of order. Instructor Music designs our mixes to be in the order listed on the product description. Verify that your song list is in the proper order. Often times, that happens when you select all the songs in the folder as opposed the folder when creating your playlist in iTunes. You can manually move the tracks around by clicking and moving it to the proper spot directly within iTunes. The other option is to highlight your Mix, on the left pane, the click on View, then Show View Options, click Track Number, so it has a check mark next to it. Then under Sort near the top, select Track. That will sort them by track number. This is caused by iCloud. All you need to do is to turn off iCloud in iTunes. Open iTunes, click on Edit, then Preferences, under the General tab, you will see a check mark next to iCloud. Click on the Check Mark to remove it, then click Save. You should be able to add all your music to your playlist now. 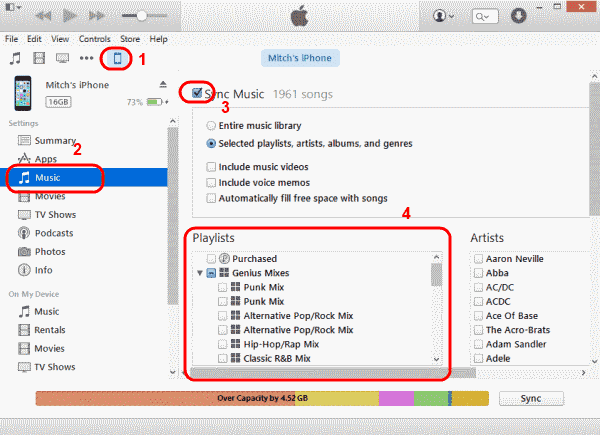 See, Adding Music to iTunes – for the best way to add music to your iTunes. Follow the standard steps for burning a CD. These include making a playlist, adding songs to it, and inserting a blank CD. When you click the Burn Playlist to Disc button, a window will pop up. In the window, there will be a menu labeled Gap Between Songs. The drop-down menu next to it lets you choose how long the silence between songs will be. For a gapless CD, choose 0 seconds. Click Burn and your gapless CD will be created. UPDATE March 2013: As of iTunes 11, the Gapless Album setting has been removed. That doesn’t mean that support for gapless playback has disappeared though. According to this helpful iLounge article, gapless playback is now supported by default and automatically, so there’s no need for a separate feature. Early versions of iTunes still have the setting described below. Most albums have short sections of silence between songs. But not all of them do — some albums are designed to have one track flow directly into the next; that silence actually disrupts the way the music is supposed to sound. This is especially true of live albums, concert bootlegs, and classical music CDs. To address this need for what is called “gapless playback,” Apple added a feature to iTunes 7. You can now set an album to not have any gaps of silence before or after it, ensuring that the music is heard as it was intended. The first step in setting gapless playback is to find the album you want and select all the tracks on it. Do this by navigating through your iTunes library, finding the album you want to edit, and then selecting all songs on it (do this by clicking one song on the album and then going to the Edit menu and choosing Select All). Click “OK.” Now, when this album plays back as a whole, it will play without the bits of silence between tracks, improving the experience of listening to it. NOTE: Gapless playback is not supported by all iPods. See the list of iPods that support gapless playback. Using your phone, place your order on our site. Once your order is complete you will get a screen with a ‘download file’ link. Press that and wait – file sizes are 50 – 90 MB, depending on what mix you ordered. The music player on my phone gives me 9GB so there’s room for 100 of our largest mixes in the player memory. Of course the amount of memory that you have available will depend on how many pictures/videos/texts/music, etc files that you already have loaded, so make sure that you have enough room BEFORE you start downloading. Starting with iOS7 , iDevices cannot natively download files, with out using a third party app …Apple has decided that only music purchased through their iTunes store can be downloaded directly on to iOS phones and iDevices and played through iTunes player on the device. You can use your computer to download the mixes, extract them, then transfer them to your iDevice. See other tutorials of how best to do that. Instructor Music has no affiliation with any of the “Apps” mentioned above, and we do not endorse them. Our Fitness Instructors have used these Apps with success for their iDevices. Although, these Apps may work for you, we cannot support them, as we have no affiliation with those Apps. As for custom mixes, we no longer do “custom” mixes, meaning, you order a custom mix and we bust it out for you. In that essence, no we don’t. However, if you have a list of titles at least 17 titles long, preferably 20 titles long. We will take that list, and if the DJ’s think it will work, they will make it. Be warned, that it won’t happen right away, as they typically are working on new mixes already and will need to fit into their schedule. If they do make “your” CD Mix, we will release the mix when it is done to our whole customer base. At that point, you are under no obligation to purchase the mix after it goes live on the sites, but you are more than welcome to. As not all songs in your list will work, or we cannot find that particular song, we reserve the right to replace any song in your list, with a song of Instructor Music’s choice. While it’s actually a very simple operation once you know how to do it, it’s not something that’s very obvious to people who are new to iOS (as many iPad users are). Here’s a look at the simplest method of transferring files to an iDevice for those who don’t yet know how to do it. Click the “Apps” tab up on top in the main panel of iTunes. Scroll down to the bottom where you’ll find a “File Transfer” section with a list of apps. From that list, choose an app you want to transfer a file to. Onto the (probably empty) space to the right of the apps list, drag in the file you want to transfer. You can also click “Add…” to browse for the file and choose it. As soon as you’ve chosen the file, it will transfer to your device. You’ll see the progress at the top of the iTunes window. When it’s done you can disconnect and your file will be on your device. Some apps provide additional ways to transfer files that you may prefer, but this is the most straightforward method and it works for every app that supports files. If you’d prefer to transfer over Wi-Fi (or another method), check the app to see if it has other methods. These methods vary from app to app, but most provide instructions so you can learn how to use the various transfer methods. They’re worth exploring if you prefer to avoid connecting your device to your computer every time you want to transfer a file. Apple iTunes has been redesigned, and figuring out the new interface can be a bit daunting. 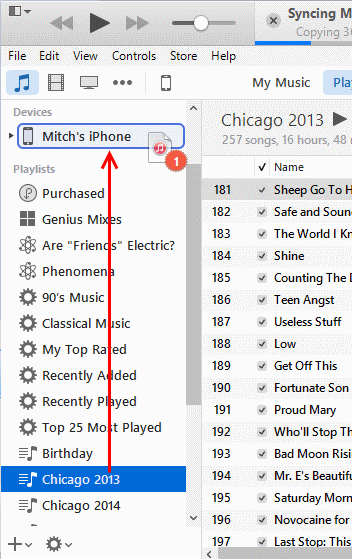 Copying playlists to an iPhone, iPad, or iPod is a bit different depending on the version you are using. Here’s how it’s done. Select the icon for your device, located at the upper-left portion of the screen. Select the “Music” option on the left pane. Ensure the “Sync Music” check-box is selected. In the “Playlists” section, check the playlists you wish to sync with your iOS device. “Music Playlists” should be listed in the left pane. Select the playlist(s) you wish to sync, then drag them up to your device listed in the “Devices” section on the left pane. They will then sync to your device. Connect your device to the computer. A button should appear for your device in the upper-right portion of the screen. Click it. Select Add To… This will make a contents menu available on the right side. Select “Playlists” at the top of the screen. Drag any playlist from the left side to the right side. Click “Done“, then select the “Sync” button in the lower right corner of the screen to sync your changes. You have successfully transferred a playlist to your Apple device. For PC’s we recommend 7Zip as it is Free. But you can use other Unzip/Extract programs to achieve the desired result. Although, Newer PC’s or Macs have Unzip/Extraction programs built in, simply by Right clicking and choosing Unzip or Extract.